Why Do We Let These Vipers Into America? 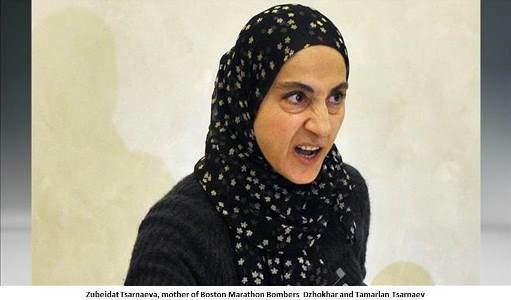 The son she described as “the best of the best” was of course Dzhokhar Tsarnaev who had just been found guilty of killing three people in the Islamist bomb attack on the 2013 Boston Marathon. It should be remembered that as “refugees” the Tsarnaevs received food stamps and welfare when their children, who later perpetrated the Boston Marathon Bombing, were growing up, according to a letter from the state Department of Transitional Assistance that was obtained by the Boston Globe. As Boston Globe Correspondent Evan Allen reported in an April 26, 2013 article, “Anzor (her husband) and Zubeidat Tsarnaev received Supplemental Nutrition Assistance Program benefits, commonly known as food stamps, from October 2002 to November 2004, when Dzhokhar would have been about 8 to 10 years old and Tamerlan 15 to 17. The family also received them from August 2009 to December 2011, according to the letter. Anzor was also a Transitional Aid to Families with Dependent Children grantee from January 2003 to March 2003, and again from August 2009 to June 2010. Transitional Aid to Families with Dependent Children is a state and federally funded program that provides cash assistance to families with children and pregnant women, according to the letter. The program is commonly known as welfare. The Tsarnaev brothers were both in the country legally. During the time the time the Tsarnaevs came to America, from 2000 to 2013 (the last year for which statistics are available) some 2,338,013 legal immigrants arrived in America from Muslim countries. Why does America need over 2.3 million Muslim immigrants? What is the benefit to America? Moreover, what are the risks? Which government agency is vetting who arrives, who gets to stay and who qualifies for US citizenship? Moreover, such questions do not constitute “Islamophobia.” Moderate, assimilated Muslims know these kinds of questions are fair minded and entirely reasonable. After all, the Egyptian and Pakistani people also face Islamic terrorism in their own countries. It is naive to believe that could not (and is not) happening in America. As we concluded in our columns “America's Suicidal Muslim Immigration Policies” and “Importing Jihad,” Islam, as it is today practiced by millions of Muslims across the globe, is inimical to the separation of church and state and government based on constitutional liberty. We are in a war of ideas, not just with radical Islamists, but with concepts deeply embedded in Muslim culture. And as long as mass legal (and illegal) immigration from Muslim countries continues unabated we are losing that war. Which leads us to ask, why would we bring these vipers to America and PAY THEM to stay here? We urge you to contact your Representative and Senators (the Capitol Switchboard is 1-866-220-0044) to demand that America freeze immigration from Islamist terrorist hotspots until there is a security investigation and assimilation process in place that will guarantee we are not importing more jihadis and social vampires like the Tsarnaevs to America. George Rasley is editor of Richard Viguerie's ConservativeHQ.com. A veteran of over 300 political campaigns, he served on the staff of Vice President Dan Quayle and as spokesman for now-Chairman of the House Armed Services Committee Mac Thornberry. He has served as a staffmember or consultant to some of America’s most recognized conservative political figures. He is a member of American MENSA and studied international relations at Worcester College, Oxford. Rasley has studied Islamic culture for 40 years, lived and worked in a Muslim majority country, and traveled extensively in the Islamic world. Submitted by robert_1 on Fri, 04/10/2015 - 15:32. Submitted by al.78.1931 on Mon, 09/14/2015 - 22:41. We must stop and reverse the immigration of all Muslims that denounce American citizens. If we do not immediately screen out the radicals and deport them we Might as well dig out our bombs and destroy all. are known to be rapists of young girls. Would Obama be stupid en.ough to bring this on his own daughters?